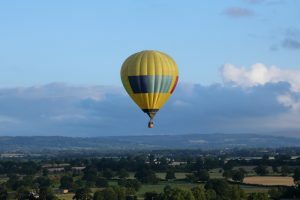 The inaugural Oswestry Balloon Carnival took place on 25/26 August 2018. 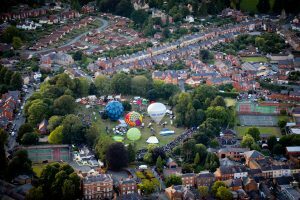 After last year’s Oswestry Balloon Festival at the nearby Ironworks, this year the event was incorporated into Oswestry’s annual town carnival, taking place in the heart of the town as a free event for the town’s people. On Saturday morning we were greeted on-site with a snug launch field which certainly wasn’t without character. 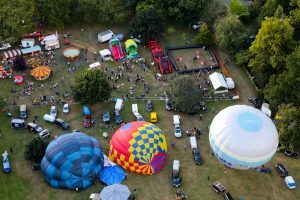 Whilst balloons had to carefully lay out between obstacles such as trees and a bandstand, complete with angry wasps nest, there was something very heart-warming about squeezing a complete balloon event into a local town park. By complete I mean, you had the launch field, with a balloonist entrance and exit, and you had a number of food stalls and children’s slides, and that was the event, all within a localised environment. There was a terrific sense of community spirit. Things were a little fast on Saturday morning but a small number of balloons fancied giving it a go and were able to enjoy a quick flight, once they had negotiated the town park and nearby rooftops. 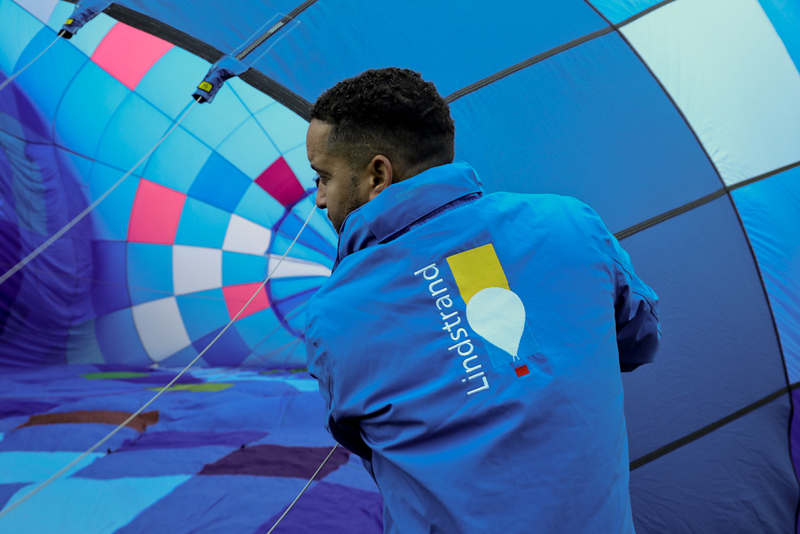 Lindstrand Technologies were instrumental in pulling the balloon aspect of the carnival together, and had many balloons in attendance, including He’s Back, the Per Lindstrand balloon featuring a giant banner of Per and some of the Lindstrand Tech demonstrators, including a hopper. 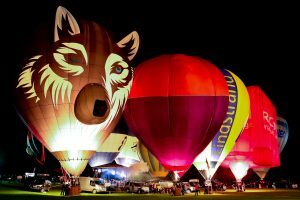 Several Lindstrand special shapes were also in attendance and stole the show, including the Panasonic Battery and Wes the Wolf, making his first appearance at a balloon festival. 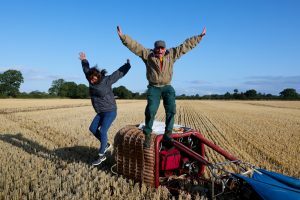 The giant ‘baby’ penguin Tall Steve, operated by Exclusive Ballooning, was also in attendance, making it to Oswestry having just returned from the Red River Balloon Rally Festival in Shreveport, Louisiana, USA. Balloons tethered throughout the day on Saturday, with clouds breaking up nicely to inject some real warmth. The evening flight was called on, and some 30 balloons launched out of the quaint launch field to roars of excitement from the crowds. And crowds there certainly were; the place was absolutely packed and every balloon launch was greeted with wild cheers and applause. It’s always great to see balloons flying at a place where the local people are not as accustomed to seeing balloons flying as they are elsewhere. 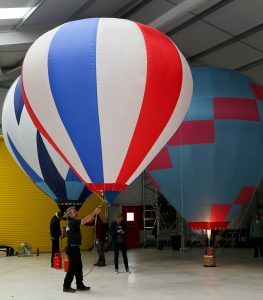 Here, there was a lot of love for ballooning and all those involved in putting on this show. Shapes received extra big cheers, such as Captain Jack, the Donkey, the Battery and Tall Steve. There was also an opportunity at this event for young trainee pilots to have their moment, with the He’s Back balloon being piloted by Matt Billing, a young PuT who went off on his solo flight test and passed with flying colours. The balloons flew for around an hour, flying directly over the town before landing in the Shropshire countryside. The day climaxed with a spectacular Night Glow, with Wes the Wolf being the star of the show. Unfortunately, the weather became all Bank Holiday on the Sunday and ballooning activity was cancelled. However, en route home we took a detour to a fabulous new restaurant deep in north Wales which more than made up for the gloomy conditions. Reflecting on the event, it’s been confirmed that more people attended this event than any other in Oswestry town history. So, is there an appetite for balloon events in this part of the world? You’d better believe it and Lindstrand Technologies are at the forefront of making this happen. This was a superb community event for the people of Oswestry and brought balloons and the general public closer together than ever. For many of these people, this would have been the closest they’ve ever come to a balloon before and there was a real sense of warmth and admiration for all those taking part.